Hello, my name is Thomas Kielhofner. I'm a System Tech. at the Plaster Student Union here. I recently installed a complete 7.1 surround sound system (effectively a 13.2 system) in a medium sized auditorium, and am using the Marantz AV8003 preamp/processor which includes your MultEQ technology. My question is about the mic placement for measurement in a room like this. First I'll show you two pictures with labeling of where the new speakers are now installed (sorry for the crude sketch, I don't have any recent pictures after the install has been completed though). Hopefully you can make out the rough locations of where the speakers are located. 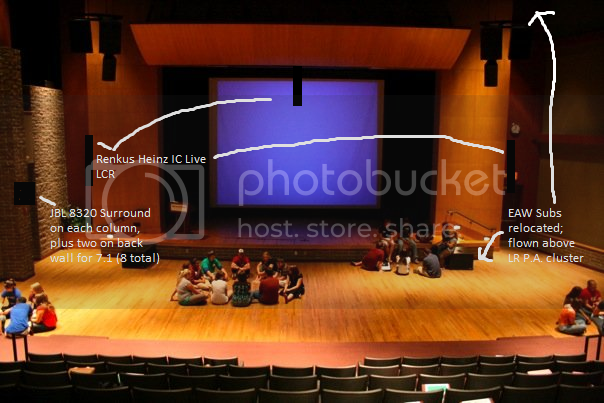 The front left, center, and right are Renkus-Heinz IC Live speakers. They're digitally steerable and have already been aimed (the left and right were also physically angled inwards towards the center of the seating, and the center which is flown above the screen is angled downwards somewhat. On a side note, the center isn't actually blocking the screen, we changed to a widescreen Da-Lite screen which had enough black border fabric above it to keep the center from sticking out in front of it). 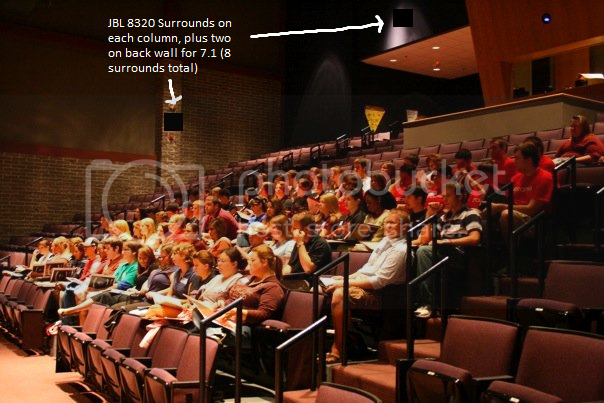 There are 8 surround speakers total, all of which are JBL 8320 models. There is one on each of the six columns on the sides of the room (3 on the left, 3 on the right), as well as two high up on the back walls. Finally, there are two EAW SB1000z subs flown above the L/R P.A. clusters (the full range L/R P.A. clusters are used only for mics, and is a separate system from the surround sound. The two subwoofers are shared between the surround system and P.A. system because neither are used at the same time). The Renkus-Heinz speakers have internal amps, the EAW subs are powered by Crown Professional K2 amps, and the surrounds are powered by Crown CDi 1000 pro amps. All the amps have their level controls set to nominal (or very near it), and I haven't found any problems with the receiver setting one channel too high (except the subwoofer). If you need any more pictures or information I can provide it as well. My main question is just where to place the mic in such a large room? We had to use a pre/pro like the Marantz because we didn't want to install a commercial audio system (such as one from DTS or Dolby), and we playback movies through a Swank media player or from blu-rays rented from Swank Motion Pictures which are connected through HDMI. I know it's usually used at home where the room isn't so large, which is why I'm not sure where to place the mic in this huge room. My second question is how much should I compensate for the dramatic reduction of the subwoofer level by MultEQ after calibration (I measured once from the very center of the room already just to see what it would do)? I used a tripod which sat the mic just about at ear level in the middle row of the center row of seating, but still got results where the subwoofer was turned all the way down (about -18 db). After listening to some movies and music it was clearly too low (unable to be heard at all), but I wasn't sure how much I should raise it. None of the other speakers which have the same amp level settings show this dramatic reduction in gain either (all amps receiving signal from the AV8003 are set near 0 db or at their nominal position). Below I have links to all of the audio equipment we're using in the system just in case. Thank you for your time. I recommend that you start with the first measurement in the center of row 3 (center section). Then move to the end seats to the left and right of that section for the next two measurements. Then move back 2 rows and take three more measurements in the same pattern. Note that the delays and levels for the speakers are set by the first measurement so it's important to keep the mic in the center of the room. In your case that will mean placing it between the two middle seats (since there appear to be 6 seats per row. Regarding the sub, this is a common issue. Unfortunately Audyssey doesn't get to set bass management. Marantz uses a rather high frequency (80 Hz) as the decision point to set speakers to Large (i.e. no bass sent to the sub). Please make sure that after MultEQ is finished (and the results saved) that you go into the setup menu and change every speaker from Large to Small. Pick a 60 0r 80 Hz crossover for them. This will properly redirect bass to the sub that is better equipped to handle it and it will also give you the benefit of much higher resolution MutlEQ filters in the sub channel. I wrote much more on this topic here. I believe that you are only getting the LFE track being sent to the subwoofer and not the rest of the bass because some (or all) of your speakers are set to Large.